*You can make this with just one of either, but it’s going to take you twice as long because you need two layers of each. I made this cake with only one springform pan. Cake: prepare box mix according to the instructions on the box. Stir in the strawberry jello. Pour into two greased 9″ cake pans and cook according to the instructions on the box. Place 16 ounces of cream cheese, cornstarch, and ½ cup of whipping cream into a mixing bowl and mix. Next add in the vanilla extract, followed by the sugar and mix until the cheesecake filling is nice and smooth. Line your springform pan with parchment paper and spray the sides with cooking spray. Scoop 3 cups of the cheesecake filling into the pan. Place the cake pan on top of a rimmed cookie sheet, the pour about 1½ cups of water into the cookie sheet. Bake for about 30 minutes at 350 F.
Remove from the oven, and let cool completely. You can remove it from the springform pan after about 10 minutes and transfer it to the fridge to chill. Add half a box of Nilla wafers to a food processor along with 4 tbsp of butter, and 1 tbsp of ice water. Add the cookie mixture and press into the bottom of the pan evenly. Pour the remaining of the cheesecake filling into the springform, and smooth out. Bake on 350 F for about 30 minutes. Add the remaining cookies into the food processor, along with 1 tbsp ice water, and 4 tbsp of butter. Pulse until it resembles large crumbs. Do not over pulse! You may need to do this in batches. Separate the mixture into two bowls. Add strawberry gelatin to one bowl. Melt 1/4 cup butter in the microwave and mix in red food coloring. Toss into the cookie crumbs. You can add additional coloring until you get the desired color, but mixing it with the butter is a little trick I discovered to coat the crumbs more evenly! Line a cookie sheet with foil, then sprinkle the red and white cookie crumb on separate sides of the sheet. Bake on 350 F for 10 minutes. Add ½ cup of softened butter, and 8 oz of softened cream cheese into a mixing bowl. Mix until well incorporated. Add in ½ cup of whipping cream and 1 tbsp of vanilla. Mix until well combined. Sprinkle in 2¼ cups of confectioners sugar a bit at a time and mix until the frosting is smooth and lump free. Once all the layers are cooled transfer the cheese cake with the crust to the plate you want to serve your cake on. 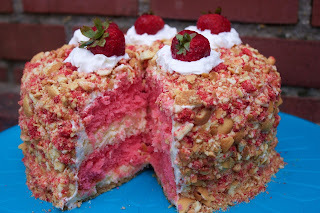 Carefully top with a layer of the strawberry cake with the flat side on the bottom. Level the top, if needed. Very carefully transfer the center cheese cake layer on top. Again, level if needed. Top with the second layer of cake (I’m going to guess that you know to do it carefully by now! Now if there are any areas where the cake is uneven, you can carefully cut around the sides using a serrated knife. Frost the sides and top of the cake. If you are making the night before, refrigerate overnight at this point. Remove the next morning and bring to room temperature in the morning. I would be nervous about the cooking crumbs becoming soggy if refrigerated overnight, so recommend doing the crumbs the day of for the freshest cake. Sprinkle the shortcake crumbs on top of the cake and pat onto the sides as well. I rotated between the plain and strawberry crumbs to make sure it was coated evenly. Refrigerate until about an hour before you’re going to serve. Remove and let come to room temperature. Garnish with whipped cream and strawberries!